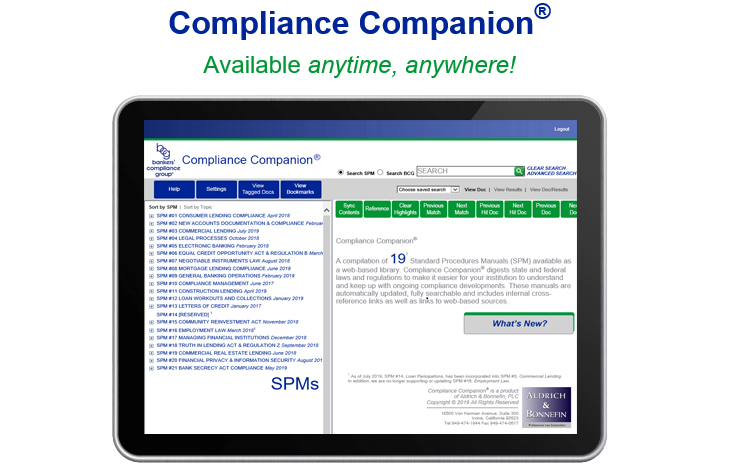 Compliance Companion® is a one-stop regulatory compliance resource for financial institutions. This online compilation of 21* leading compliance manuals takes the legalese out of federal and California laws and regulations, making it easier to understand and keep up with ongoing compliance developments. Published by Aldrich & Bonnefin, PLC, Compliance Companion® has many useful features including search capabilities, links to internal cross-references and web-based sources as well as samples of forms and notices. This compliance resource can also be accessed from your mobile device making it faster and easier to get the latest federal and California laws and regulations.